The River Isbourne is a tributary of the River Avon. Only thirteen miles long, it rises on the Cotswold escarpment, joining the Avon at Evesham. It’s reputed to be one of only two rivers in the world that flows entirely south to north (the other being the Nile)! Our monitoring of the Isbourne has revealed that the river fails to meet the requirements for good ecological status under the Water Framework Directive. A major reason is the absence of some fish species we’d expect to find in a river of this type. Roach, Chub, Stone Loach and Minnows are missing from the upstream sections, while Roach, Stone Loach and Gudgeon are missing from the downstream part. Like many English lowland rivers, the Isbourne has a number of redundant mills along its length, many of which have weirs and water management structures associated with them. These often represent significant obstacles to fish trying to swim upstream to breed or colonise upper parts of the catchment. 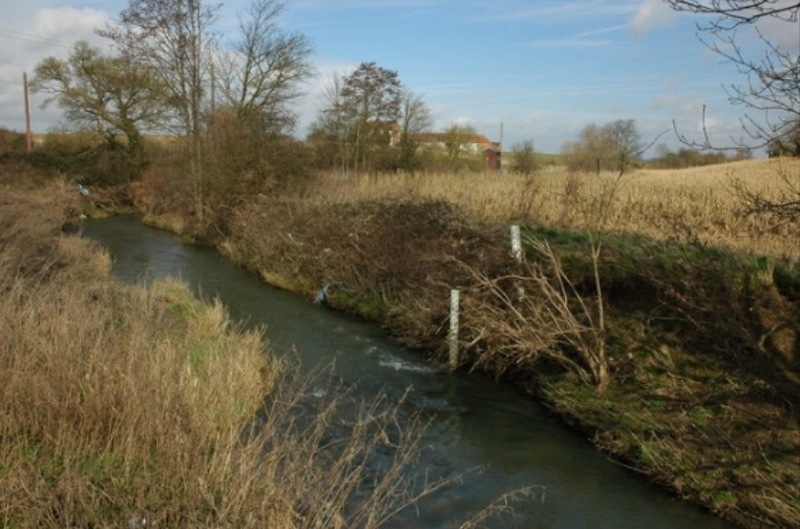 Because of its proximity to the Avon, the Isbourne should provide important extra habitat for fish normally resident in the Avon, as well as supporting its own resident populations. This means that barriers at the downstream end of the river have a disproportionately large impact. The first upstream obstruction on the Isbourne is at Hampton Mill, approximately 750m above the confluence with the river Avon. 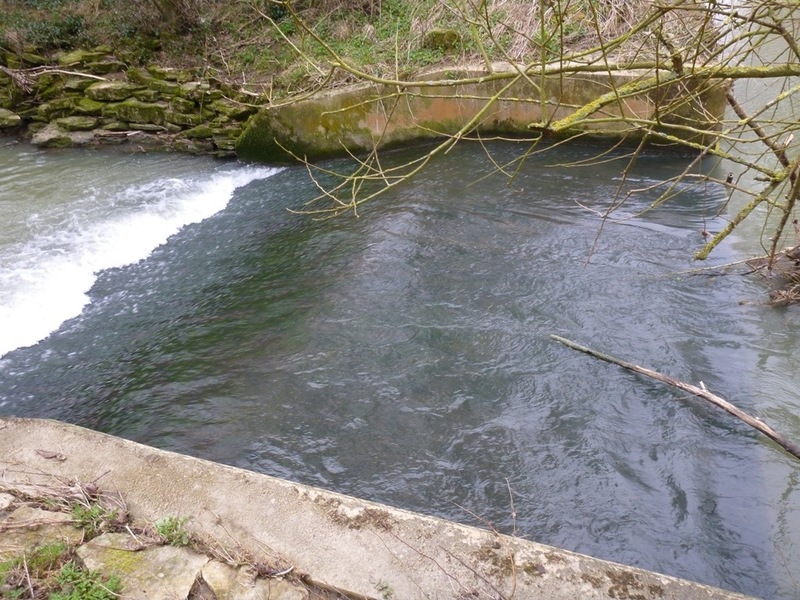 The legacy of a redundant mill, the two metre high weir was causing a moderate barrier to fish as the water flow was too fast and shallow to allow them to swim over it. 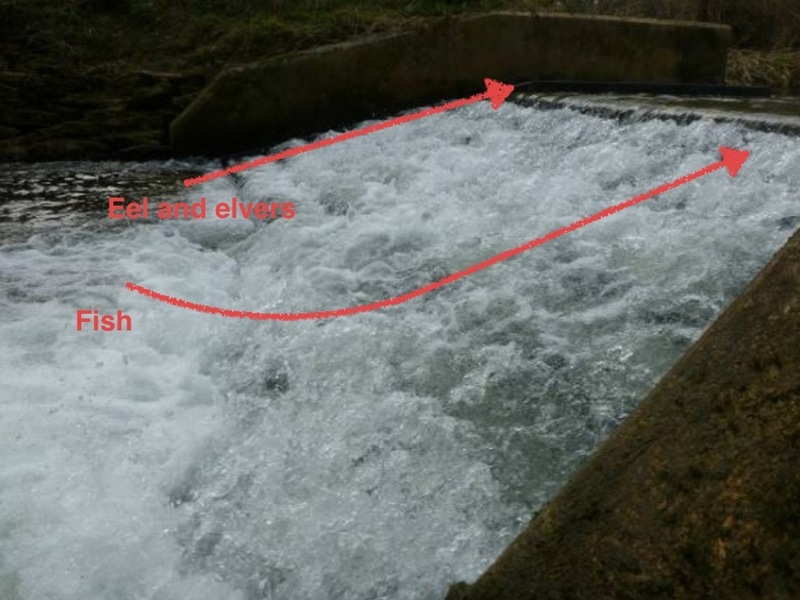 During high flows and flood conditions the weir is drowned out allowing fish passage, but not during normal flow conditions. The picture below shows the weir before we got to work. Ideally we would like to remove barriers like these completely and return the river profile to its original state. This, however, is very expensive and can also sometimes lead to knock-on impacts to local flood risk and erosion. 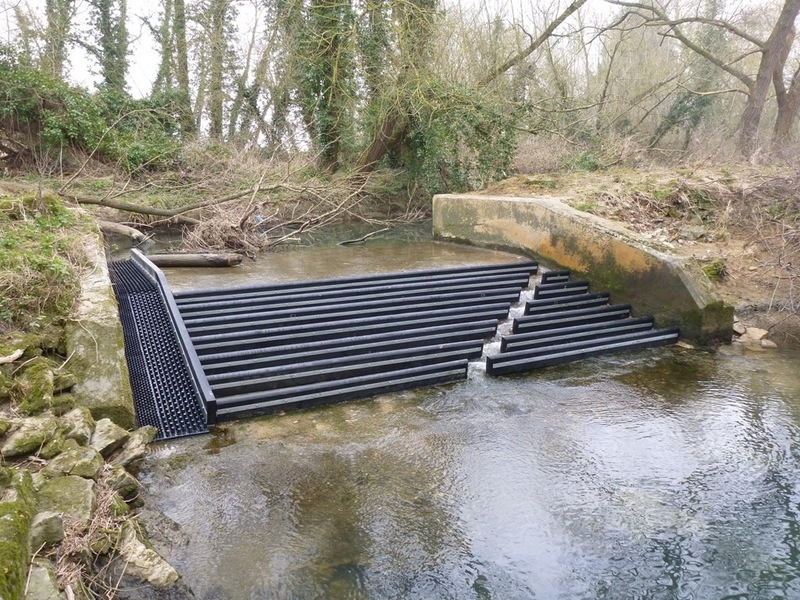 In the case of Hampton Mill weir we’ve attached a series of baffles to the existing structure, as seen in the picture below. 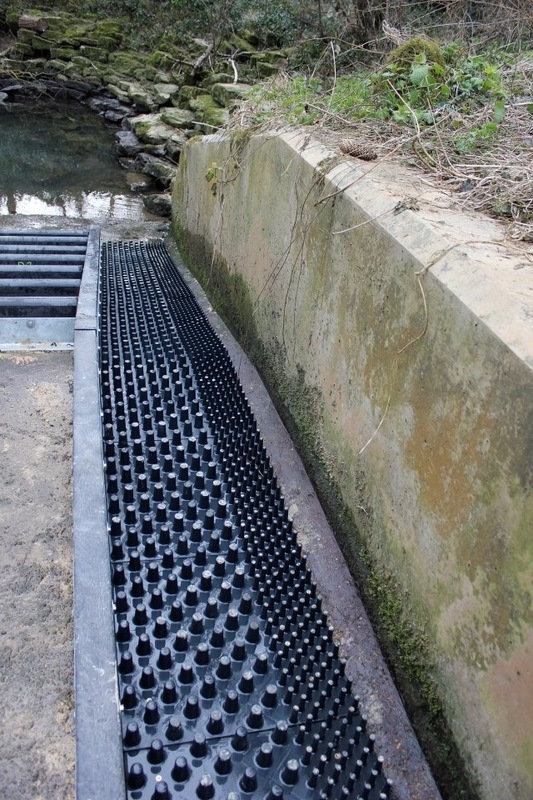 The baffles, which are made out of recycled plastic, can be fitted quite quickly and don’t require any major structural work to the weir. The design is intended to increase water depth over the weir, and reduce the flow velocity. This will make it easier for fish to swim over the weir to reach additional upstream habitat, including spawning gravels. We have also installed eel tiles along the right wall of the weir. Again, fabricated from recycled plastic they are covered with lumps and bumps of various sizes and encourage eels and elvers up the weir. They like to stick to the sides of things as they move along! The photo below shows water going over the weir after the baffles were installed last week. You can see that the flow is being significantly disrupted and the water velocity is reduced. This will make is much easier for fish of all species to pass. We hope that they will form an orderly queue to explore this lovely catchment. Our river monitoring programme will show how successful we’ve been over coming years. Hampton Mill on the River Isbourne is just one of over five thousand structures across the Midlands that we believe is having and adverse affect on fish movements. Over the last couple of years we have been working to identify and rank them according to the impact that they’re having. This is part of our ongoing work to secure compliance with the Water Framework Directive. We have a programme of projects across the region which address some of these barriers. We currrently have about a hundred different schemes being designed or built. Clearly there is a long way to go but by identifying and prioritising we can ensure what resources are available are used to best effect. My monthly weather updates usually focus on water, but this March has been truly exceptional for another meteorological reason – cold. In the Midlands it’s been the coldest March since 1892 with an overall average temperature over 3c lower than we would expect. The contrast with last March, which was one of the warmest on record, could hardly be more stark. This blog compares the two remarkable months and tries to explain the reasons why the weather happened. 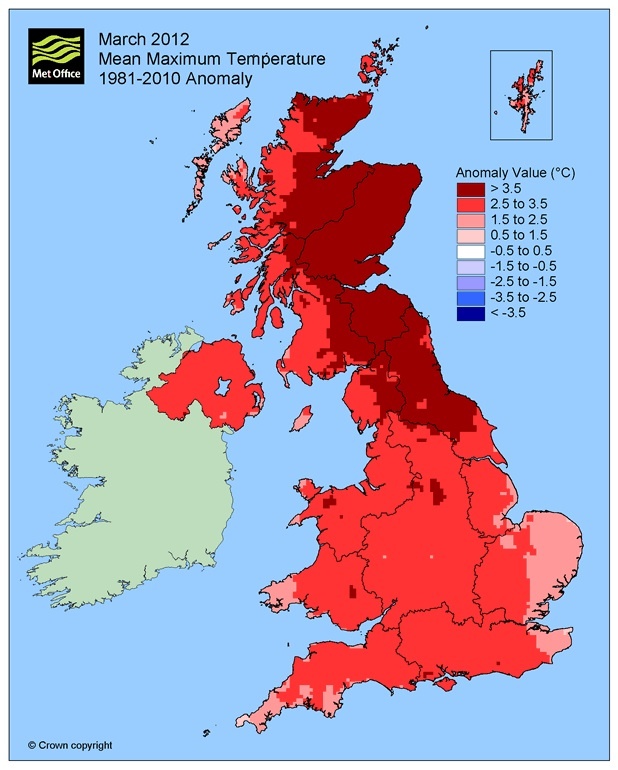 March 2012 was exceptionally warm. The month was also dominated by high pressure meaning it was also dry and pretty sunny. All in all a very nice month! The records show that March 2012 was the third warmest March since records began in 1910 and the warmest since 1957. Overall temperatures were 2.3c higher than average. It also broke the record for the biggest positive anomaly for maximum temperatures (below), being 3.2c above what we would expect. Towards the end of the month temperatures soared into the low 20’s which is more than 10c higher than the average maximum temperature for March. The weekend of 24/25th saw glorious sunny, warm weather across the country. 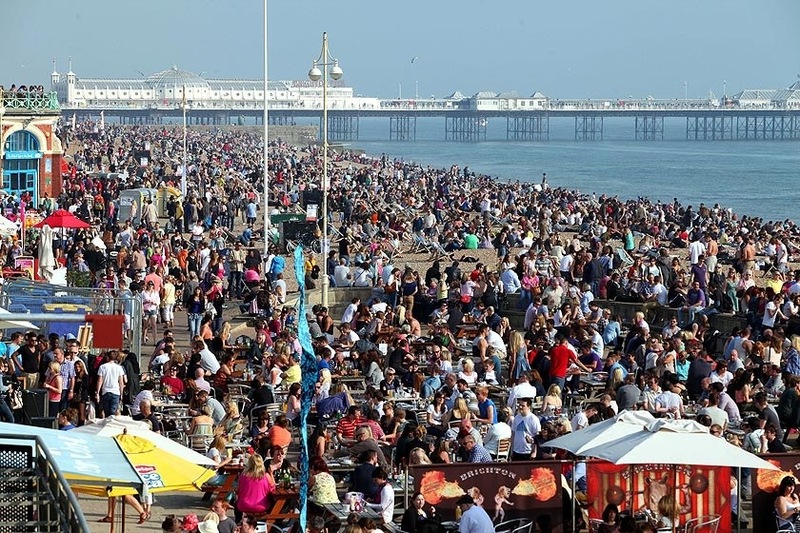 Beaches (like Brighton below) and resorts did very brisk business. Although it wasn’t wall to wall sunshine, March 2012 was much sunnier than average. The map below shows many parts of the UK, including most of the Midlands, enjoyed 50% more sun than we’d normally expect. A look at the daily maximum temperatures for Pershore in Worcestershire shows that 10c or higher was recorded on all but five days and 15c or more on twelve days. Coming on the back of 18 very dry months, the warm dry conditions began to lead to environmental problems. 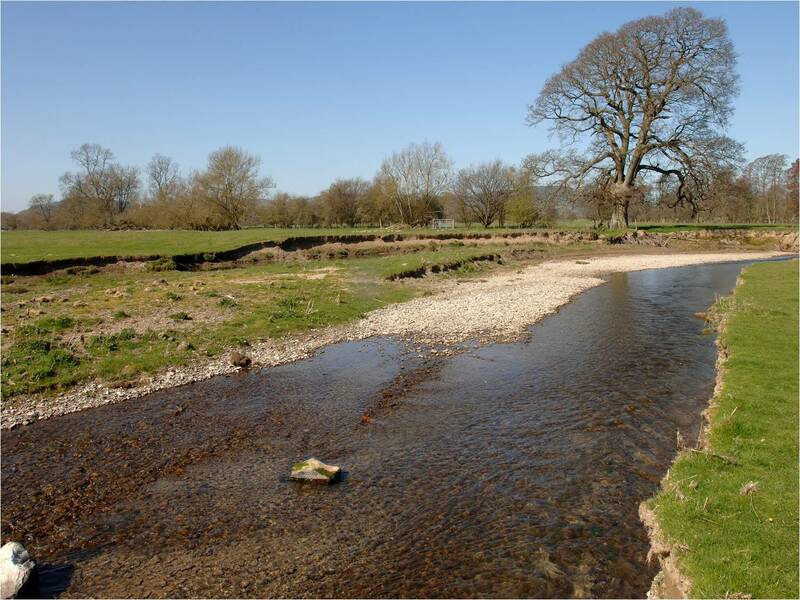 Many rivers (like the Teme below) had very low flows and the very warm temperatures meant oxygen levels in some lakes and canals began to drop dramatically. We carried out a number of fish rescues in the Midlands during the month. March 2013 started cold and, with a very small blip, stayed cold. Compare the maximum temperature chart for Pershore (below) with the one for 2012 (above) and you’ll see that 10c was reached on just one day (26 in 2012!) and 15c wasn’t reached at all (12 days in 2012). With an average Central England temperature (a temperature record going back to 1659) of 2.7c it was the coldest March since 1892. 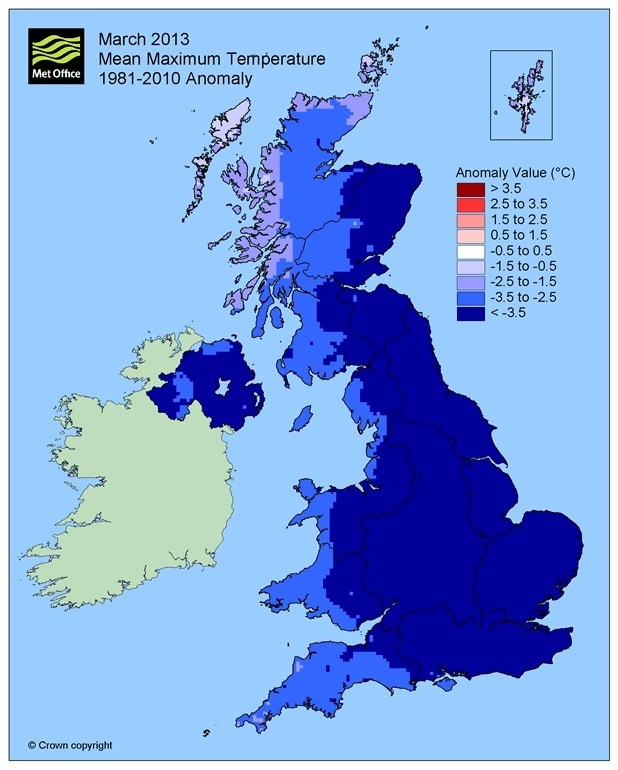 For England as a whole it was the second coldest March on record (1962 being the coldest). Here data only goes back to 1910. Average maximum temperatures were more than 3c lower than expected (map below). Also unusual was the fact that March was colder than any of the winter months (December, January and February). The last time that happened was in 1975. To make matters worse the month was also very dull. 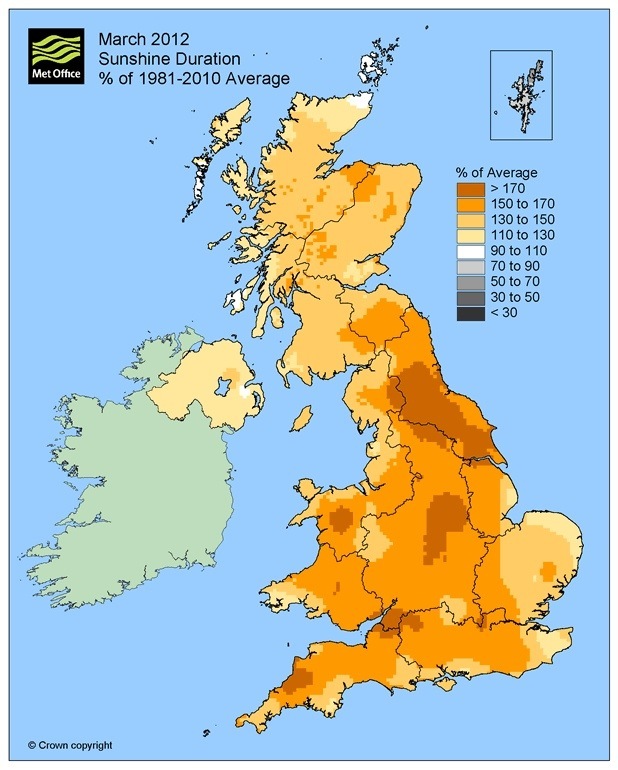 Many areas only saw around 80% of average sunshine, compared with the 150% of 2012 (map above). Prevailing easterly winds brought lots of low cloud off the near continent and North Sea. The satellite picture below (from 23 March) shows a fairly typical setup. Conditions on the ground would have felt particularly cold and raw with temperatures hovering around freezing both day and night. Snow fell on many days as the easterly flow encouraged the development of snow showers, particularly across eastern parts of the country. 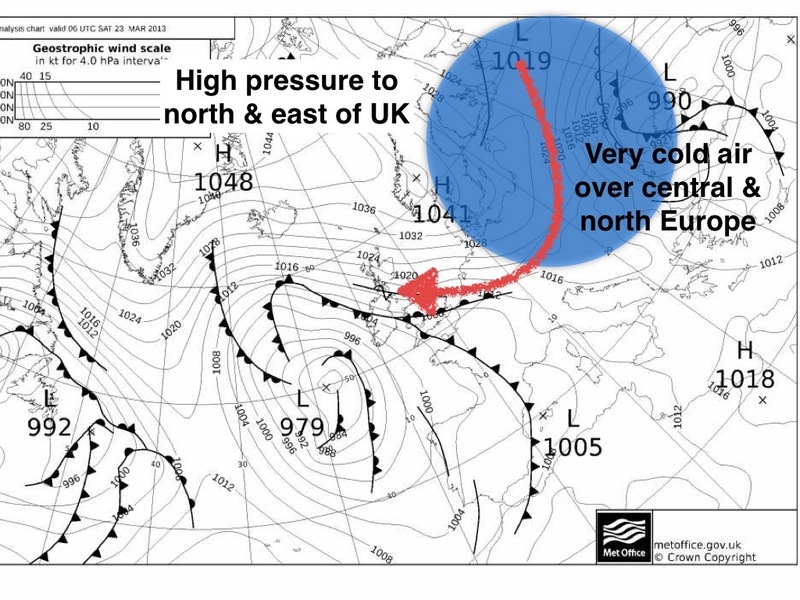 However, the main event happened during the weekend of 23/24th when warmer air off the Atlantic tried to push into the UK but met much colder air resident over us (see 22 March post below). 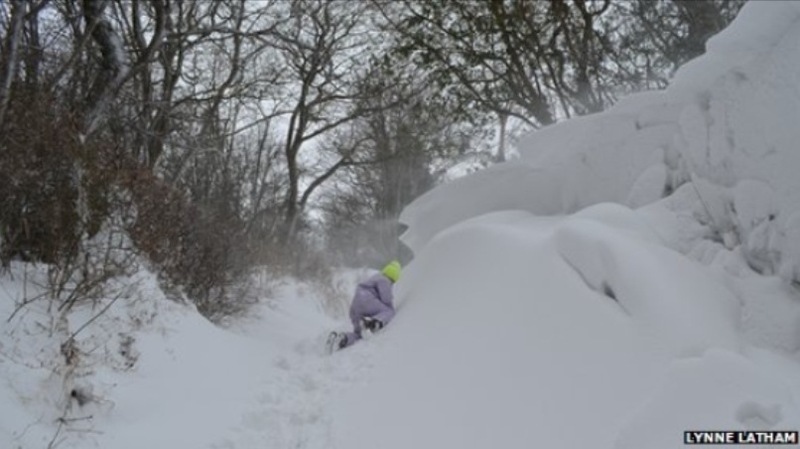 The outcome was heavy snow and blizzards for many parts of the country. North Wales, North West England and Northern Ireland were the worst affected areas. The Midlands marked the boundary of warm and cold air and therefore saw huge variations. 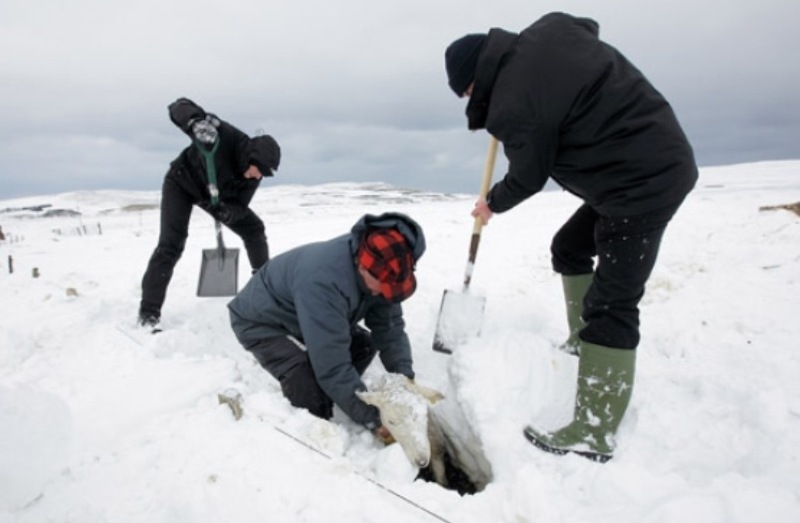 Gloucestershire and southern parts of Worcestershire and Herefordshire had an inch or more of rain with widespread minor flooding while upland parts of Shropshire were buried in six foot snow drifts (below). The weather remained exceptionally cold through to the end of the month meaning there was little thaw of the lying snow. 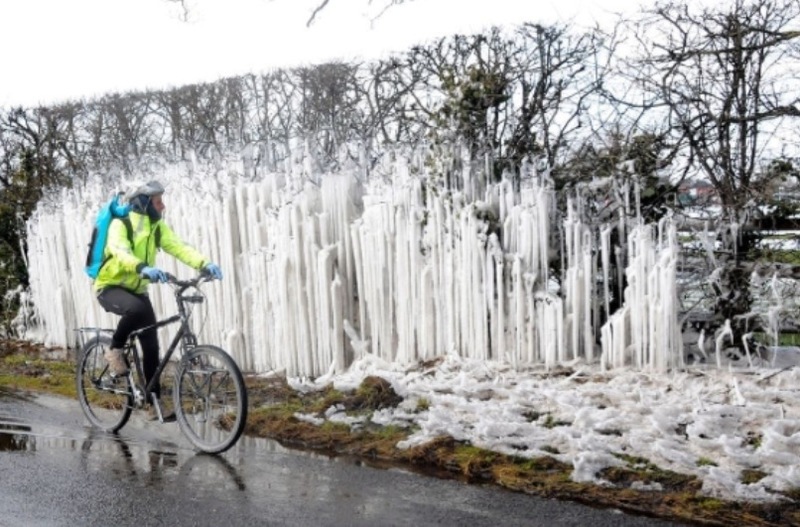 At the start of April many places still had significant snow cover and enormous icicles! The economic impacts of the arctic conditions have yet to be calculated. They will be significant! The tourism industry, hoping for an early boost in difficult economic times, suffered from booking cancellations and greatly reduced attendances, especially in the locations most affected by snow. 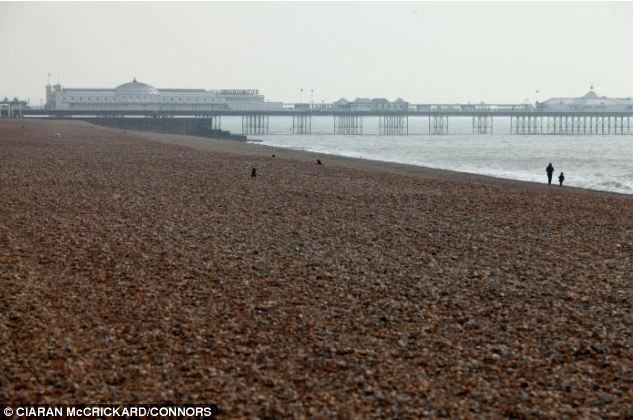 Below is another picture of Brighton Beach, the same weekend as the one above, but in 2013! The farming industry, beleagured by three years of drought and flooding (see bonkers weather post below), suffered dreadfully in some parts of the country. The costs of feeding and housing stock indoors increased and getting crops planted and established was very difficult. Worst affected though were farmers in upland areas, many of who spent the month trying to keep animals alive and rescue them from snow drifts. Some, like the sheep below were lucky, many thousands more were not. Early estimates suggest well over 25,000 sheep and cattle have died as a result of the cold and snow. Remarkably the weather setup for March 2012 and 2013 was quite similar. Both months were dominated by large high pressure systems. High pressure, near the UK holds back rain bearing weather systems in the Atlantic. Consequently both months were drier than average, with 2013 seeing around 65% of average rainfall while 2012 saw a tiny 40%. But the position that the high pressure systems sat in made a huge difference to the temperatures and type of weather we experienced. 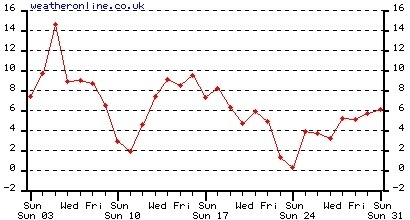 In 2012 the highs tended to be located either over the UK or a bit to the south. 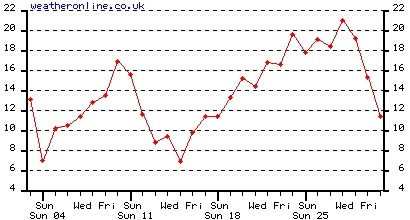 A Met Office chart, typical of conditions in 2012, showing the positions of weather systems is below. Winds move in a clockwise direction around high pressure systems. Crucially the winds which blow over us pick up their characteristics from the areas they pass over. In the case of 2012 the winds (red arrow) had come over a lot of very warm land and air in southern Europe and north Africa. Clear, warm and sunny conditions were the result. 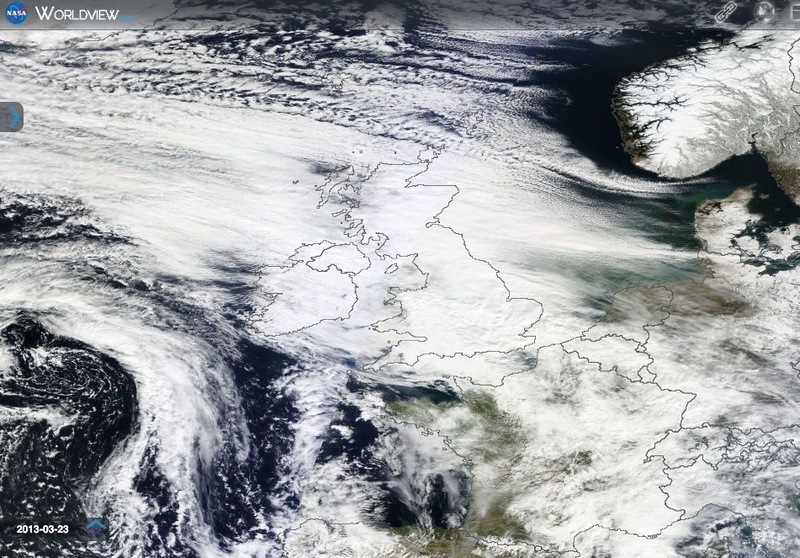 In 2013 the high pressure systems set up shop to the north and north east of Britain. Indeed high pressure dominated much of the northern hemisphere for the month. This is quite an unusual phenomenon called northern blocking and has resulted in very cold conditions over northern and eastern Europe but unusually wet and windy conditions for much of the Mediterranean as weather systems get shunted below the blocking highs. 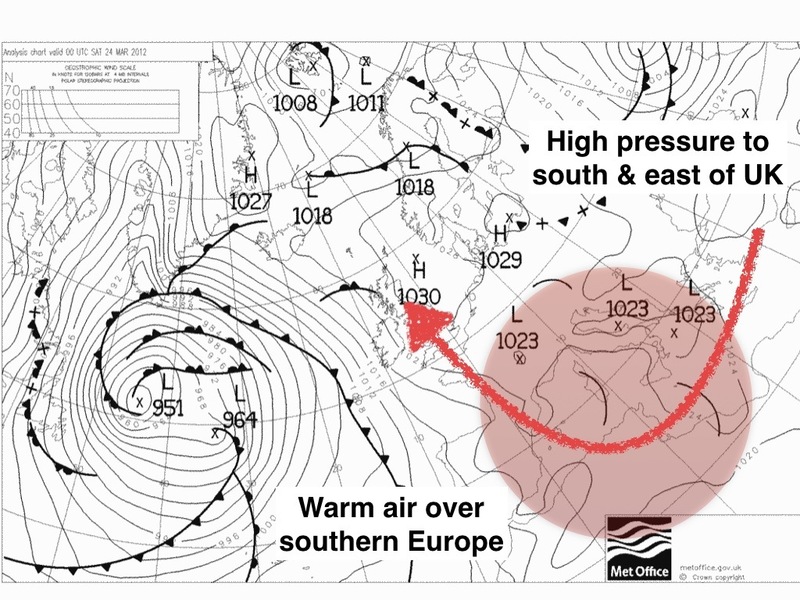 The chart below from the end of March 2013 shows winds again going clockwise round the high but this time picking up bitterly cold air from Scandinavia and eastern Europe. As we move into the second week of April there are strong signals for a change in the weather. It’s expected that Atlantic weather systems will finally break through as high pressure to the north and east of the UK finally declines. Temperatures should eventually recover to somewhere near average. What comes next is anyone’s guess!